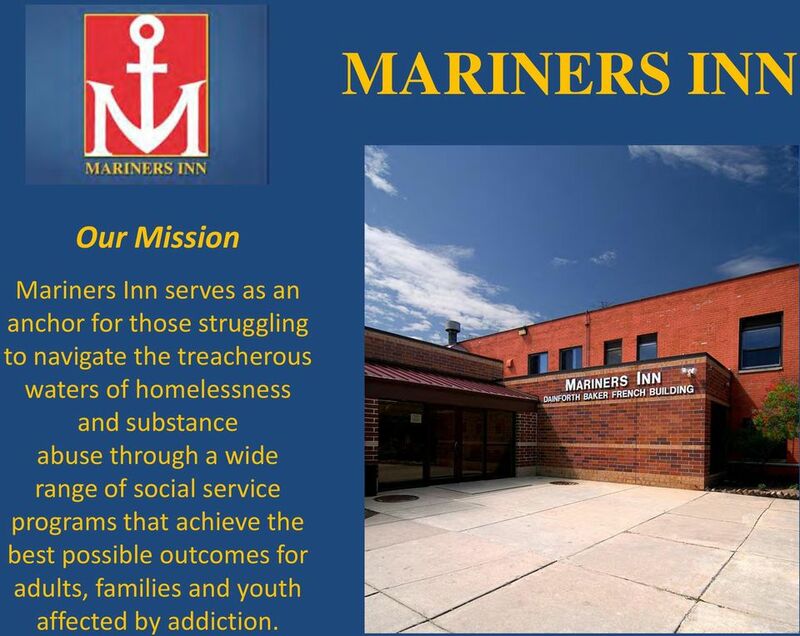 Download "MARINERS INN Our Mission"
1 MARINERS INN Our Mission Mariners Inn serves as an anchor for those struggling to navigate the treacherous waters of homelessness and substance abuse through a wide range of social service programs that achieve the best possible outcomes for adults, families and youth affected by addiction. 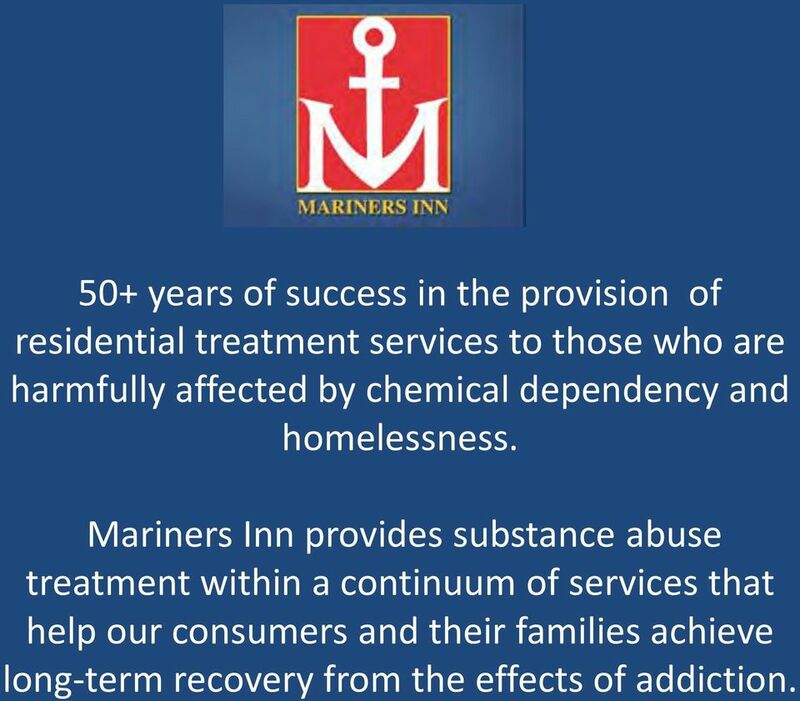 4 50+ years of success in the provision of residential treatment services to those who are harmfully affected by chemical dependency and homelessness. 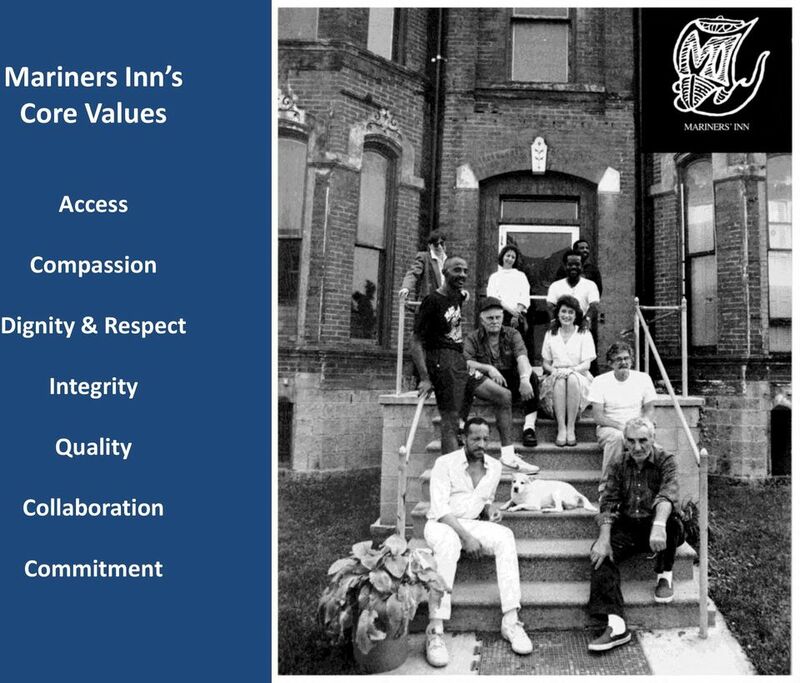 Mariners Inn provides substance abuse treatment within a continuum of services that help our consumers and their families achieve long-term recovery from the effects of addiction. 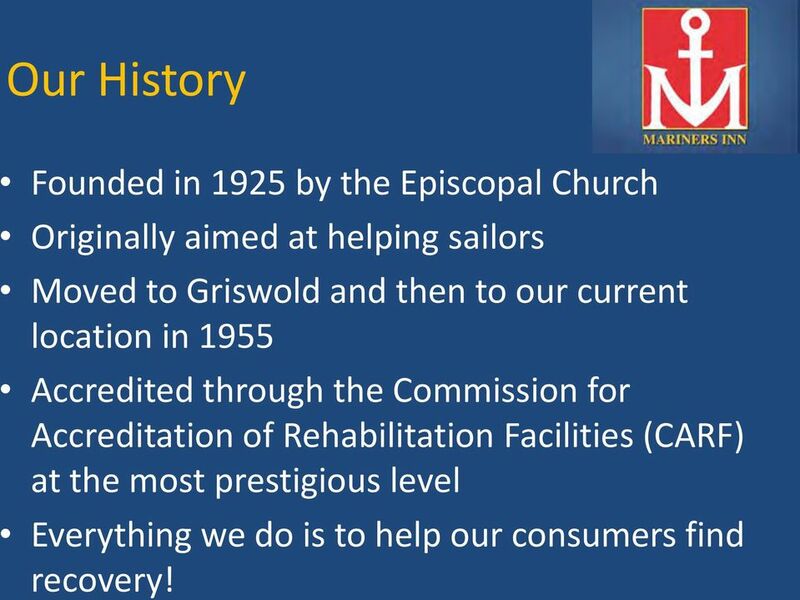 5 Our History Founded in 1925 by the Episcopal Church Originally aimed at helping sailors Moved to Griswold and then to our current location in 1955 Accredited through the Commission for Accreditation of Rehabilitation Facilities (CARF) at the most prestigious level Everything we do is to help our consumers find recovery! 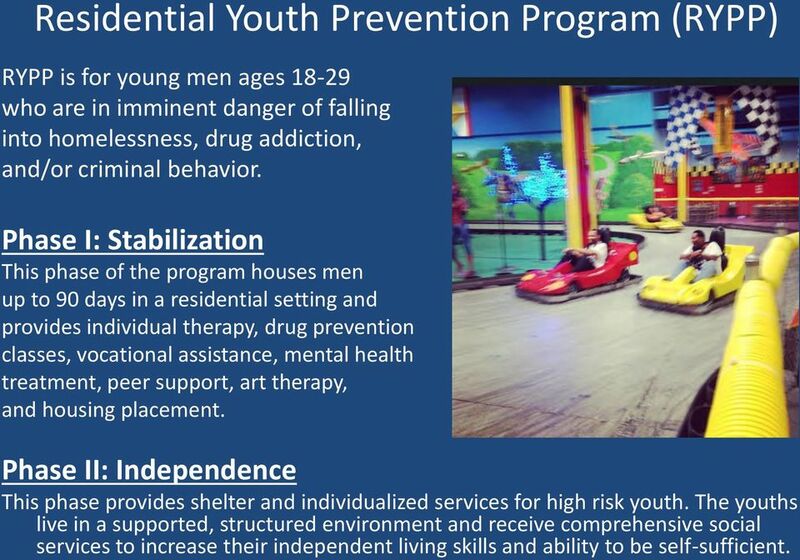 8 Residential Youth Prevention Program (RYPP) RYPP is for young men ages who are in imminent danger of falling into homelessness, drug addiction, and/or criminal behavior. 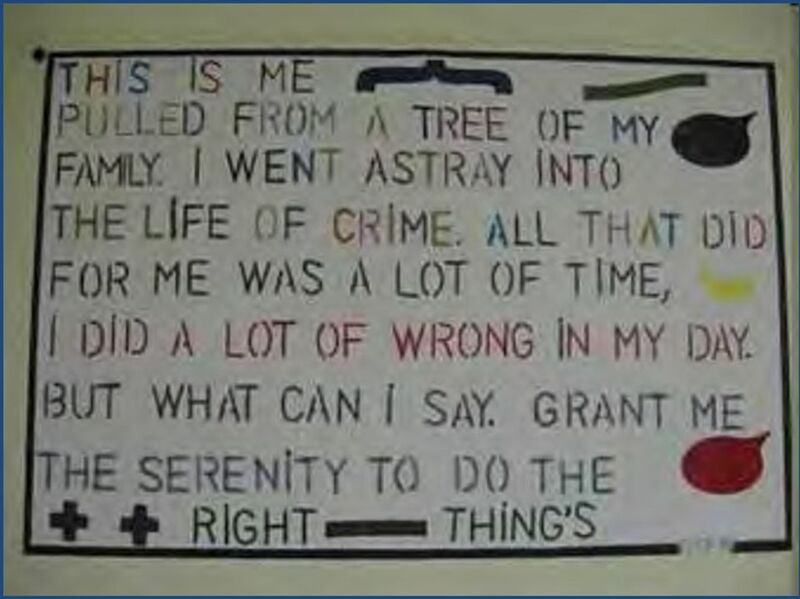 Phase I: Stabilization This phase of the program houses men up to 90 days in a residential setting and provides individual therapy, drug prevention classes, vocational assistance, mental health treatment, peer support, art therapy, and housing placement. 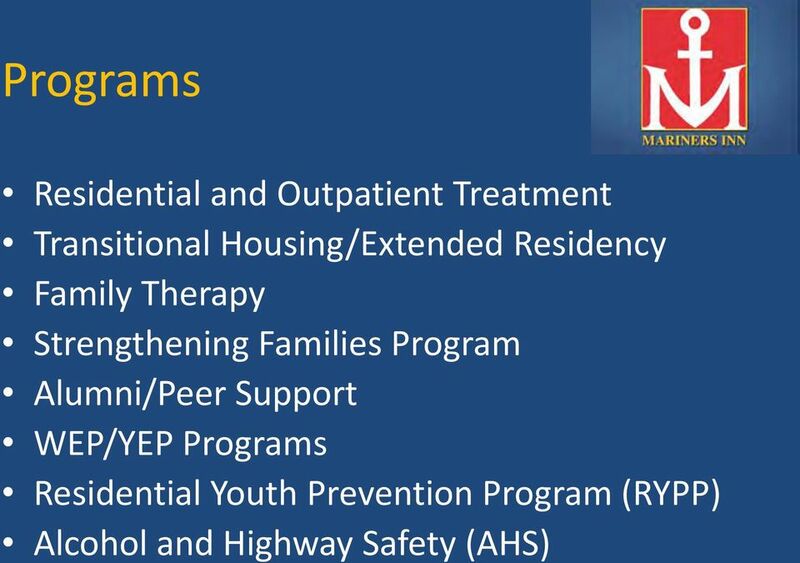 Phase II: Independence This phase provides shelter and individualized services for high risk youth. The youths live in a supported, structured environment and receive comprehensive social services to increase their independent living skills and ability to be self-sufficient. 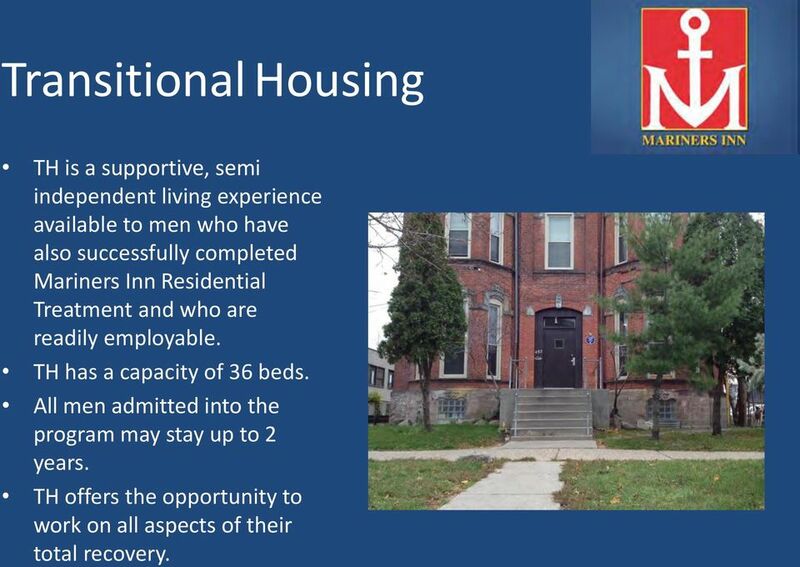 10 Transitional Housing TH is a supportive, semi independent living experience available to men who have also successfully completed Mariners Inn Residential Treatment and who are readily employable. TH has a capacity of 36 beds. 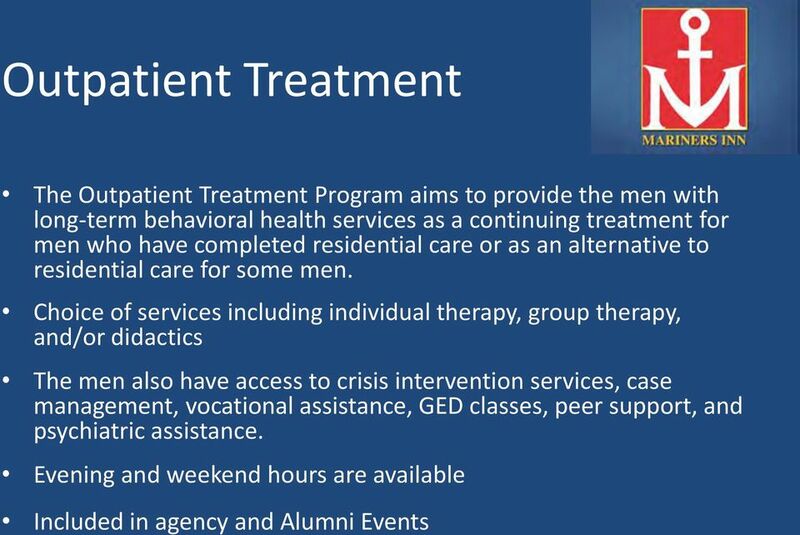 All men admitted into the program may stay up to 2 years. 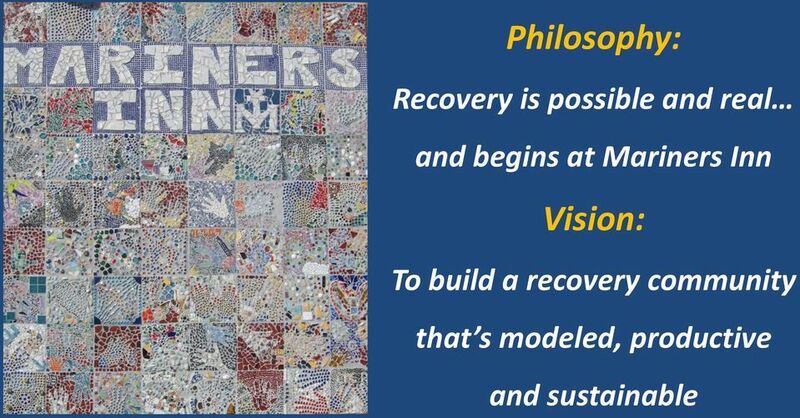 TH offers the opportunity to work on all aspects of their total recovery. 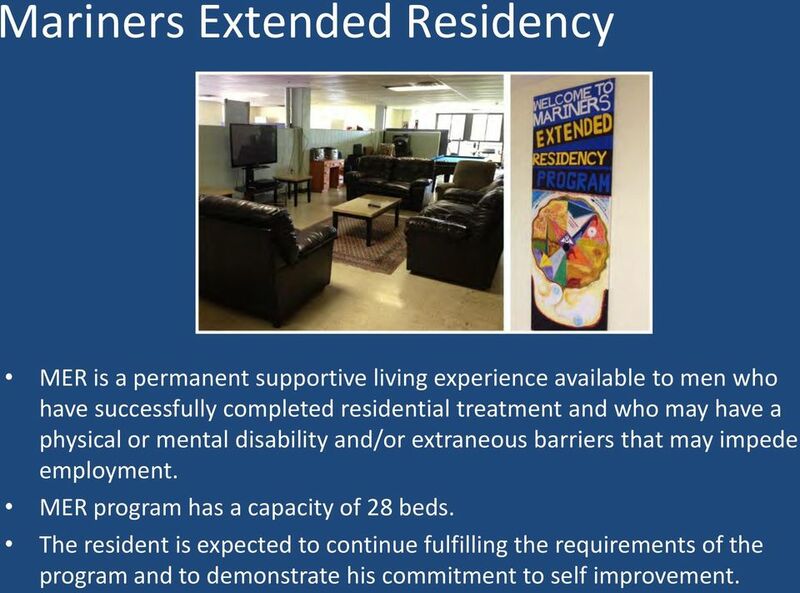 11 Mariners Extended Residency MER is a permanent supportive living experience available to men who have successfully completed residential treatment and who may have a physical or mental disability and/or extraneous barriers that may impede employment. 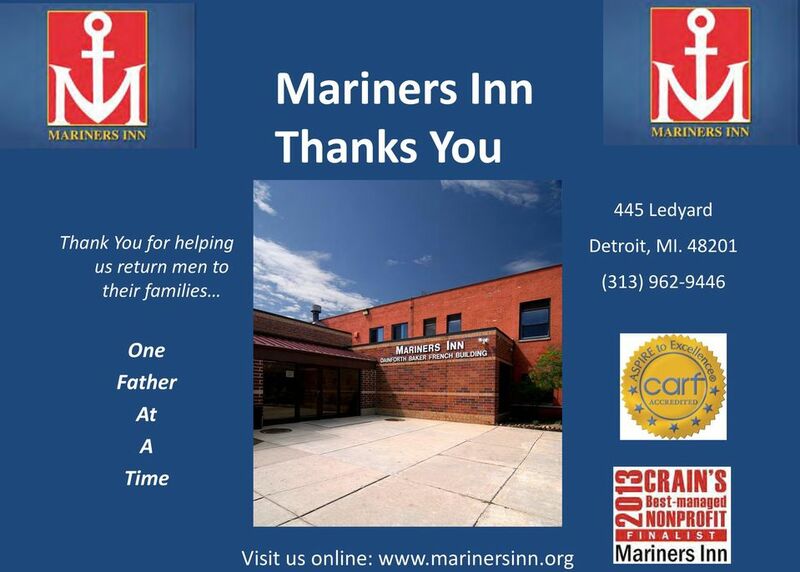 MER program has a capacity of 28 beds. 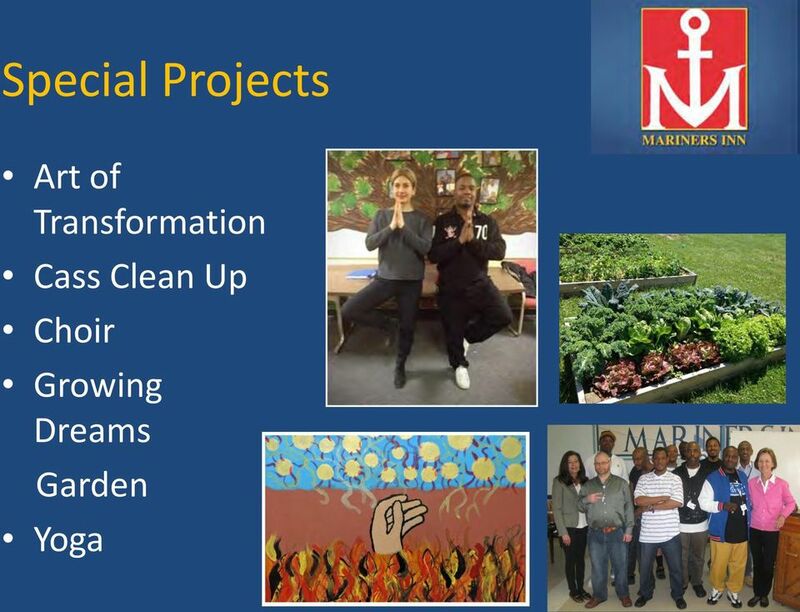 The resident is expected to continue fulfilling the requirements of the program and to demonstrate his commitment to self improvement. 12 Strengthening Families Program To strengthen family support for the client and prevent relapse, the Family Program holds orientation workshops for family and friends to help them understand addiction and the treatment process. Monthly family dinners, where clients gather with spouses, children, parents and siblings for food, fellowship and fun, are an excellent way to begin rebuilding family relationships. 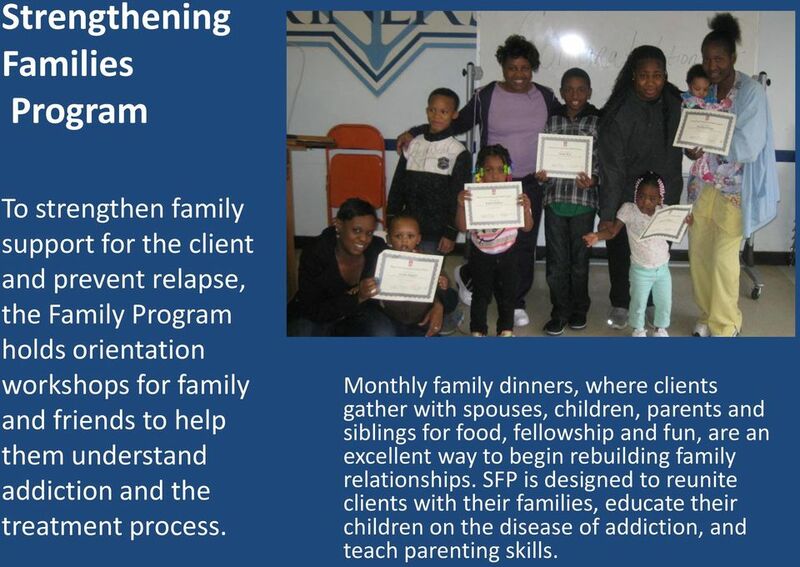 SFP is designed to reunite clients with their families, educate their children on the disease of addiction, and teach parenting skills. 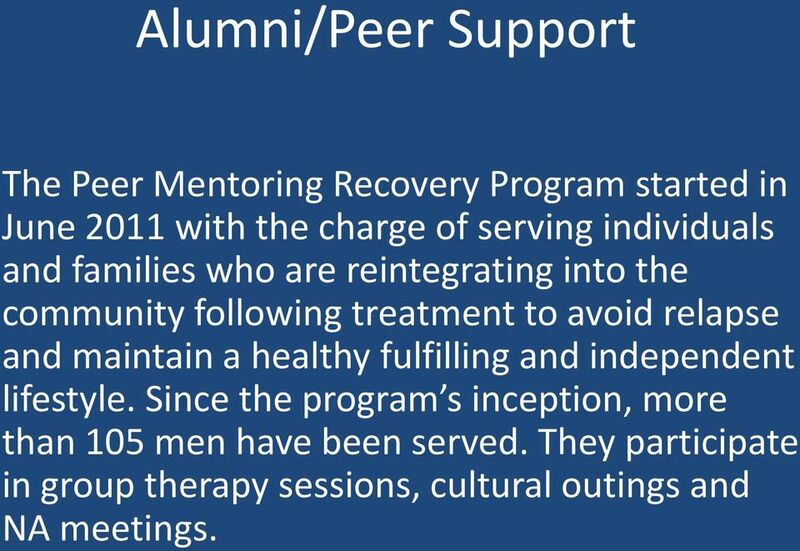 13 Alumni/Peer Support The Peer Mentoring Recovery Program started in June 2011 with the charge of serving individuals and families who are reintegrating into the community following treatment to avoid relapse and maintain a healthy fulfilling and independent lifestyle. 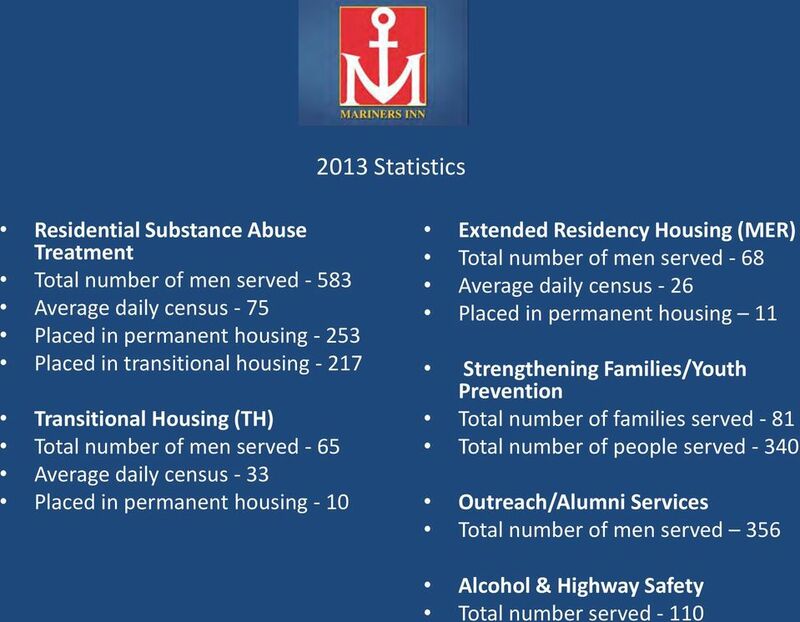 Since the program s inception, more than 105 men have been served. They participate in group therapy sessions, cultural outings and NA meetings. 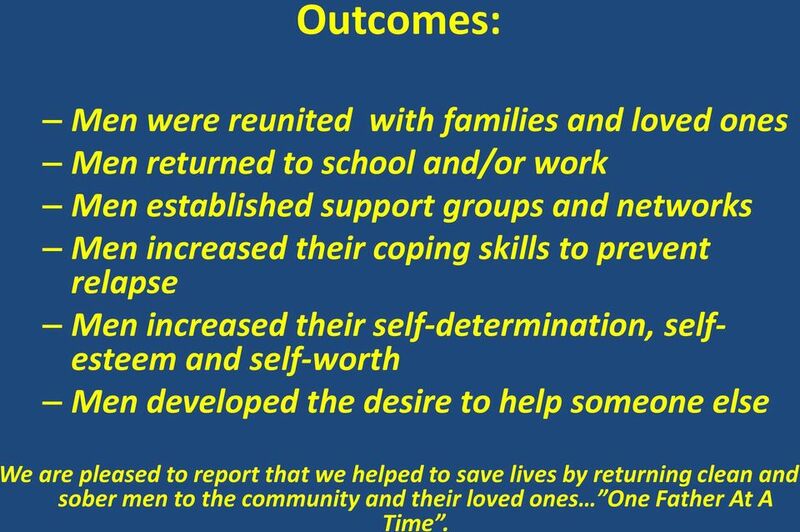 17 Outcomes: Men were reunited with families and loved ones Men returned to school and/or work Men established support groups and networks Men increased their coping skills to prevent relapse Men increased their self-determination, selfesteem and self-worth Men developed the desire to help someone else We are pleased to report that we helped to save lives by returning clean and sober men to the community and their loved ones One Father At A Time. s of California s of Los Angeles, Venice - Outpatient - Outpatient 1207 E. Fruit Street s of Los Angeles, Venice - Residential Santa Fe Springs - Residential 11015 South Bloomfield - Residential 1207 E.
Phoenix House Services for Children & Adults in California Call Center: 818 686 3079 (Monday Friday, 8am-5pm) 800 378 4435 (Evenings and Weekends) Phoenix Houses of California, Inc. 11600 Eldridge Ave. Exclusive support for lesbian, gay, bisexual, and transgender people facing addiction, mental or sexual health concerns. AT A GLANCE: 800-547-7433. Exclusive support for lesbian, gay, bisexual, and transgender people facing addiction, mental or sexual health concerns. 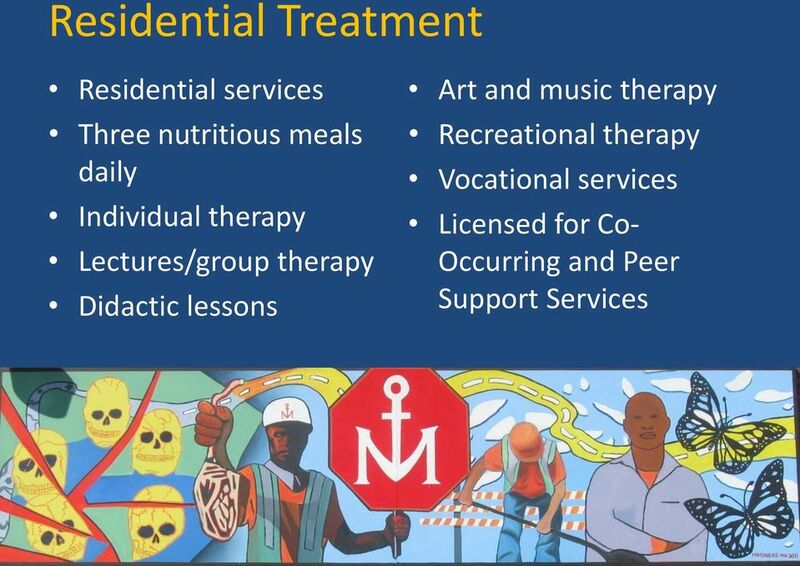 I ve been through the whole range of treatment including outpatient and residential, mainstream and alternative, court-ordered and voluntary but none of them have resonated with me like Practical Recovery. 1. Is the staff made up of a variety of professionals? Building on a century of compassionate care, shaping the future of behavioral health. Where Potential Becomes Reality for the Emerging Adult Way.pointe noun \wā-point\ A point on a journey where The journey to adulthood is not always easy or direct... a traveler can refocus and change course.